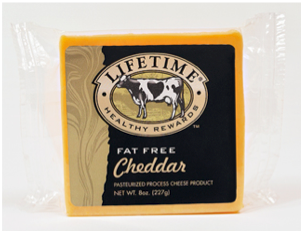 The other day at Whole Foods I was looking around in the fancy cheese section (where I buy low-fat mozzarella cheese), when a block of cheddar cheese with the words "fat free" on it caught my eye. Up until that day, I'd never seen fat free cheese in block form (only as slices) -- and this one had a couple of really important things going for it: (1) the package claimed that the cheese actually melts which is very uncommon for fat free cheese and (2) a one ounce serving was only 40 calories with 8 grams of protein. While I was standing there in the store, I started having dreams of cutting off a little chunk and eating it, as well as shredding the cheese to put it in my favorite healthy recipes. Then, I noticed there were other flavors I could buy, namely: Sharp Cheddar, Swiss, Mild Mexican, Garden Vegetable, Monterey Jack, Mozzarella and Jalapeno Jack. Picking one was a difficult decision, and I ultimately went with the Cheddar since it was the first one that caught my eye. I took it home and immediately cut off and weighed a 1 ounce slice with my food scale. I wasn't overly wowed by the taste of the cheese on its own for a snack, but once I started adding it to my cooked foods and to my sandwiches I was extremely impressed. It really does melt, making it way better than most fat-free cheeses for cooking! Apparently this cheese has been around for over a decade and is available in all sorts of stores beyond Whole Foods (like Albertsons, Safeway, Price Chopper, etc. ), so I'm surprised I've never seen it before. Maybe I'm the only one? Anyway, I'm definitely happy to have heard of it now! By the way, I did a posting a few months ago about cooking with low fat and non fat cheese that might be interesting to read as well. PS. I'm working on a recipe for low calorie fat free cheddar sauce using this cheese, which I will write about in a future posting. I'm also thinking about melting this cheese across some huuraw chips, which I think may be divine! FF cheddar cheese, so good to know that they exist and that they really melt.... I can't wait until my next trip to WF. Please share more recipes that you do with it, I'm looking forward to see it. Hey Emily - I'm pretty sure that this brand makes a fat free mozzarella version. Hopefully you can find it at a store near where you live. If not, low fat mozzarella isn't too bad if you don't eat too much of it. It was a great question, though! I'll check it out!! :) PS, your profile isn't listed on blogger so I am unable to find your blog..
Wow, cheese that melts for 40 calories an ounce? I have not seen this at my Miami Whole Foods, but will search. I'm new here, but if you have posted the cheese sauce you mentioned, please remind us all. Broccoli on its own, not so great. Broc in a low-cal cheddar cheese sauce? Sounds amazing. Also, if this stuff really melts, a Ryvita covered with an ounce of it and grilled would be an awesome high-fiber snack. Great blog. I quit smoking 2 months ago, and I took up exercise at the same time, and I still gained 12 lbs in six weeks. This is really helpful and I have to explore it in more detail. Thanks!